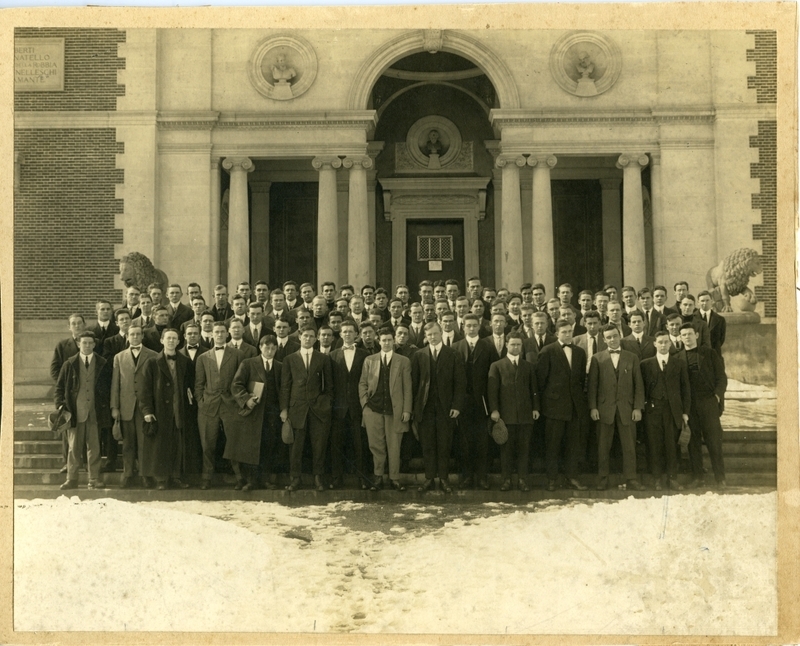 Group portrait of the Bowdoin Class of 1916. First row (left to right): Richardson, Hargraves, Drapeau, Garland, Shwartz, Fraser, Churchill, Langdon White, Moulton, Bamford, Foster, Hart, Hone, Barry. Second row (left to right): Larrabee, Hall, Cronin, Proctor, Nickerson, Kelley, Wallace Olson, Glidden, Woodman, Cruff, Stratton, Dyar. Third row (left to right): Greeley, Carter, Robie, Haseltine, Taber, Hamlin, Yenetchi, Elliott, Ginty, George Stuart, Drummond, Weatherill, Edwards, Crossman. Fourth row (left to right): Parmenter, Anthony, Wood, Thomas, Sayward, Hawes, Wyman, Gordon, Olson, Canney, Marshall, Fortin, McElwee, Irving, Hight, Baxter, Parsons. Fifth row (left to right): Rawson, Pettingill, Ireland, Webber, Boutwell, Ramsdell, Leadbetter, Chase, Knight, Beal, Hescock, Littlefield, Powers, Burnham, Haywood, Brewster, Hagerman, Haggett, Evans, Brackett, George, Don White, Boardman, Winter, Hale, Head, Bird, Gormley, Hodgkins, Weston.